Considering photography done for pleasure: I get a chance each month to choose a subject and a corresponding action, with the knowledge that the image will be printed in a publication for others to see. I regard this opportunity a privilege. Not only does it stretch me as an artist, but I get to meet interesting people who are passionate about their jobs. I have photographed, mascots, bakers, bikers, industrial machine operators, potters, musicians, athletic trainers, chiropractors, clergy, doctors, volunteers and many more men and women working in professions that serve us. 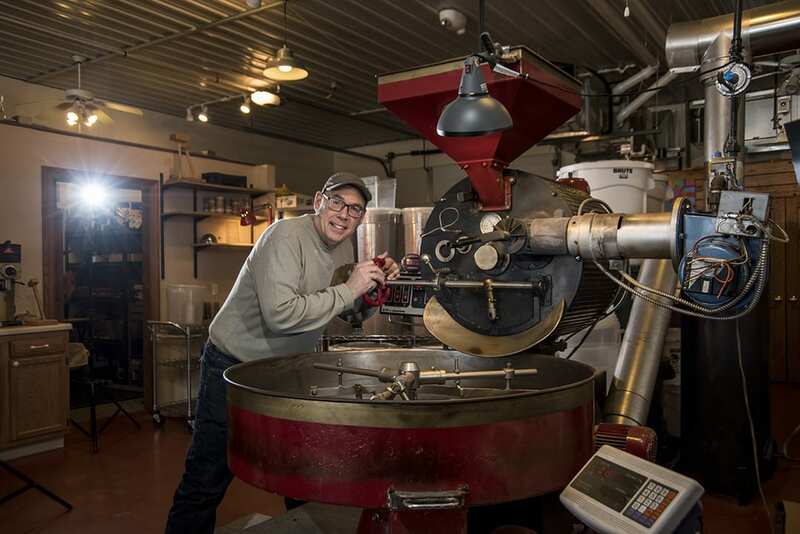 My latest subject was barista and coffee roaster, Daniel Gould-owner of Uncommon Grounds in Appleton. The passion for his profession was evident upon meeting him. 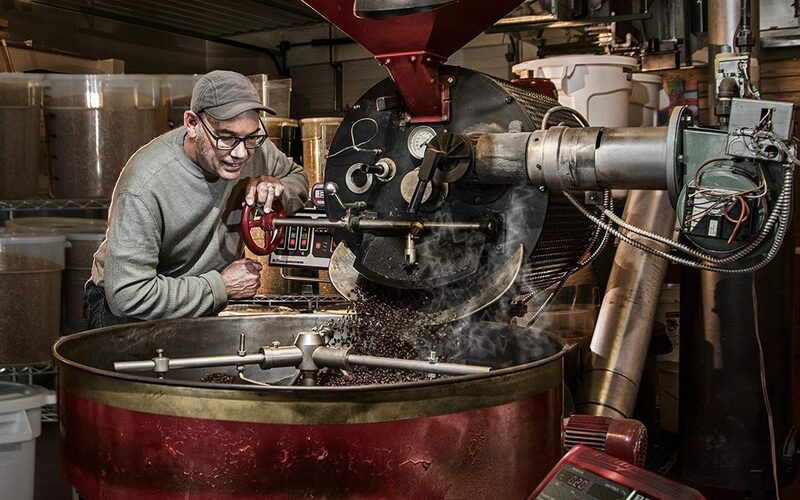 Not only does he serve coffee, fresh, by the cup in his shop, he also imports, roasts, grinds, packages and delivers fine coffee for establishments here in the Fox Valley. I scouted his coffee studio prior to the shoot date. My idea after seeing his equipment and work environmnet was to portray him as a mad coffee scientist. The colors I wanted to accentuate were the rich browns, reds of the roasting machine and overall warm tones of the coffee beans. 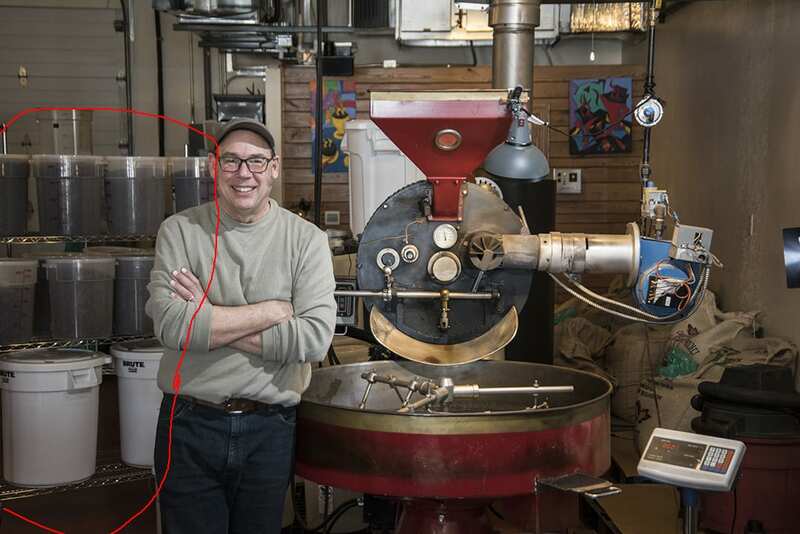 The first snapshot I made was of his huge coffee roaster. I have labeled where I placed my portable speed lights and the direction they were aimed. The lights were all on TTL triggered by Pocket Wizards. Power settings were balanced for each light, depending on how I wanted to “paint the picture”. Light A was the rim light for Dan. Light B was aimed at the background coffee tubs. Light C was aimed at Dan’s face ( zoomed to 120mm). 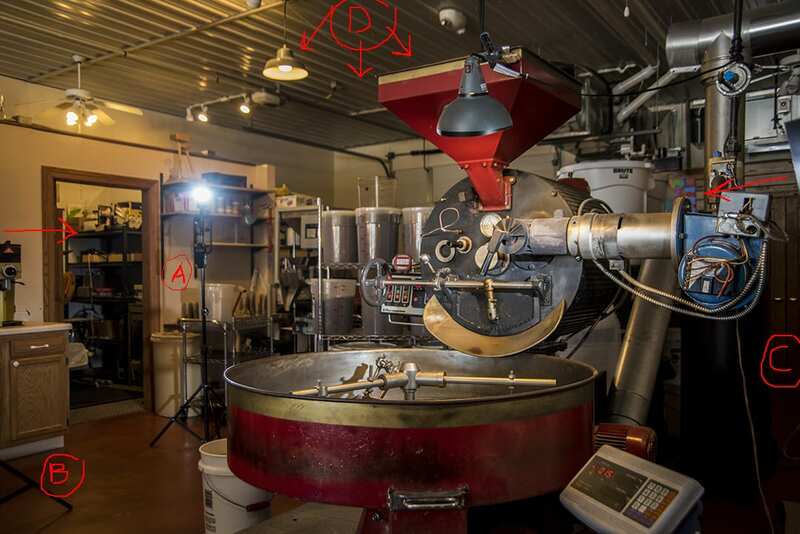 Light D was the main soft light, illuminating the entire roaster and Dan. I then placed Dan in the scene, simply to see where the light fell. I made my beginning general adjustments on those lights accordingly. Liking what I was seeing, I began to fine tune things: I gelled the rim light (A) to a 1/2 amber. The main light (D) had a dome diffuser on it. The other 2 lights (C and B) were zoomed out to 120mm to focus on specific areas. (As I mentioned, C was on Dan’s face, and B was on the back coffee bins.) I decided to keep Dan’s hat on. Next, Dan loaded the green beans into the roaster. I positioned him the way I wanted. We had a minute or two following the 13 minute roasting time period to capture the image. I had him look over into the big roasting pan with a smile and cap tipped up. 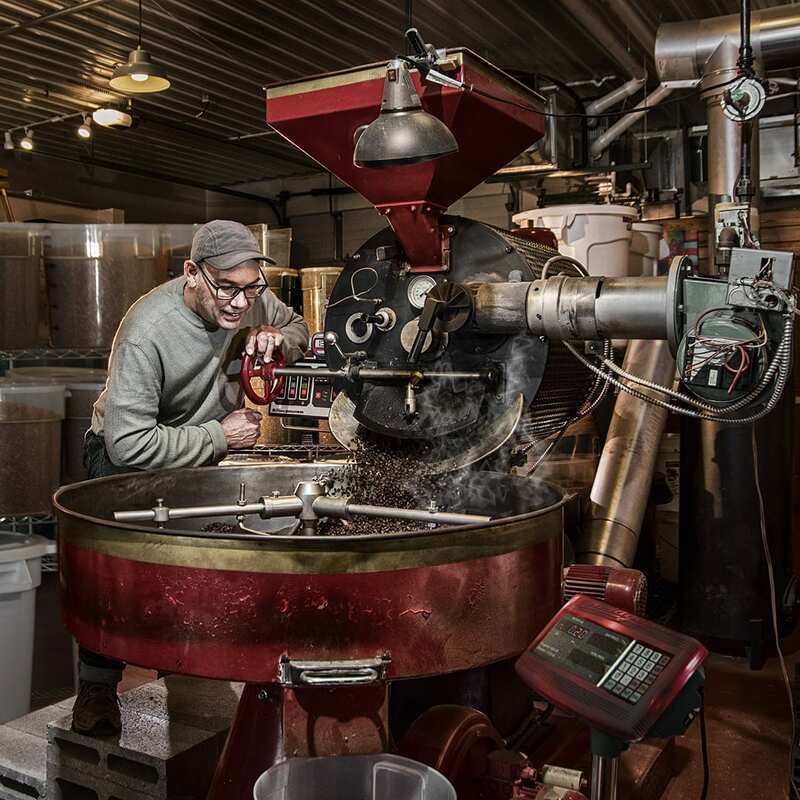 After I felt I got the good shot, he asked for a few quick environmental portraits of him with his roaster. I obliged. The happy surprise was discovered after viewing all the images later. I ended up using the big bean bins from the environmental portrait to serve as background for the main image. I didn’t like how small the bins looked in my initial image so I took the larger, more prominent bins from the environmental portrait and digitally dropped them into the final image. Post production included overlaying the computer control pad in the foreground with an industrial looking casing and turning it metal red. I added smoke to the freshly roasted beans being released into the tub. I changed color of the electrical unit on the right side of the roaster. I then flattened the image, made a duplicate layer and ran that duplicate layer through Nik HDR filter along with a 30% bleach bypass filter (found in Nik Color Efex 4). I reduced that duplicate layer back to 70 % opacity. I warmed the whole scene up with a subtle 20% increase of the warm tones by adding a tungsten photo filter in post production. I executed a few other tweeks like 20% vignette to darken the corners and distressed the visible overhead lamp finish, using an image of an old piece of industrial equipment I had in my library from a previous job. This was the final image i submitted to Appleton Monthly magazine. (Incidentally, the post production process done in front of my computer was accompanied by a cup of delicious Guatemala blend coffee at exactly 140 degrees).